Continuous casting involves complex material interactions and engineering, because molten metal is rapidly converted into strip in a very short space and time. A well-controlled, uniform flow of molten metal is critical to the performance of a continuous casting operation. This removes a significant number of expensive production steps to produce a broadly equivalent product. World-wide, most of the major aluminum sheet producers have developed twin belt, block or roll continuous casting technology but have not commercialized automotive sheet made by these routes. Among the continuous casting technologies the strip casting processes now account for a remarkable share of the world output of rolled aluminum semi-fabricated coil stock (approximately 30%). In twin belt slab casting equipment, two moving thin steel belts are provided which create a moving mold for the metal to be cast. 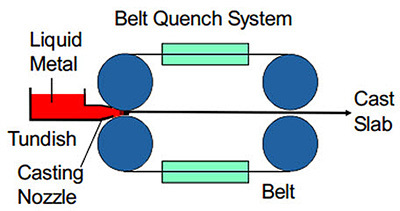 The belt is subjected to extremely high thermal gradients, with molten metal in contact with the belt on one side and a water coolant in contact with the belt on the other side. Examples for this type of casters are the newer Hazelett caster (see scheme in Figure 1) and the Kaiser caster (see scheme in Figure 2). In the Hazelett Caster the melt solidifies between two rotating thin steel belts (about 1.5 mm thickness) which are cooled during the contact with the melt. With this technology slabs are produced from 15 mm to 25 mm thickness and up to 2000 mm width. The machines are used for long lengths of plate and strip up to 1750 mm wide (bus bars, stock for sheet, foil and cans). The casting rate is 5 m/min to 9 m/min. After leaving the machine at a temperature of 420°C to 460°C the strip is immediately (in line) hot-rolled down to a coilable gauge between 2 mm to 6 mm. Thus this caster has – like block casters – at least two hot rolling stands in tandem with the casting machine. This strip is coiled with a temperature of about 200°C. This concept is based on a continuous can stock substrate processing line composed of: Molten metal holding furnaces, metal degassing and filtration, “Kaiser Caster”, hot rolling stands, annealing and quenching, cold rolling stands and coiling. For example the line is capable of producing three beverage can substrate products: body, lid and tab. The process offers many advantages over conventional rolling mills, for example major reductions in process time and capital requirements – while maintaining high quality. The thickness of the strip to be cast is related to the thickness of the belts, the return temperature of the casting belts, and the exit temperature of the strip and belts. In addition, the thickness of the strip depends also on the metal being cast. 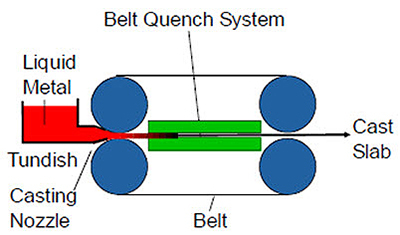 The absence of water cooling on the back side of the belt while the belt is in contact with hot metal in the molding zone significantly reduces thermal gradients and eliminates problems of film boiling occurring in the casting zone when the critical heat flux is exceeded. This design also minimizes cold framing, a condition where cold belt sections exist in three locations: before metal entry and on each of the two sides of the mold zone of the belt. Cold framing can cause severe belt distortion. Another feature is the easy starting: A quality product is available within 15 minutes. Other advantages are that product release from sticking occurs without problems and at a high production rate. The product temperature is sufficiently elevated for in-line hot rolling.